Postmedia, the publishing entity that owns all except three English language daily newspapers in Canada, made headlines this week as it announced the elimination of 90 positions from the Sun Newspapers and other owned publications like the Ottawa Citizen, Calgary Herald and the Edmonton Journal. The cuts included editors like Stephanie Coobs of the Edmonton Journal, noted sports columnist Eric Koreen and other award winning journalists like the, now former, Ottawa Sun Courts reporter Tony Spears. In November we reported that a decline in print journalism will affect PR professional’s ability to get stories in paper or online. This is an example of that actually occurring. 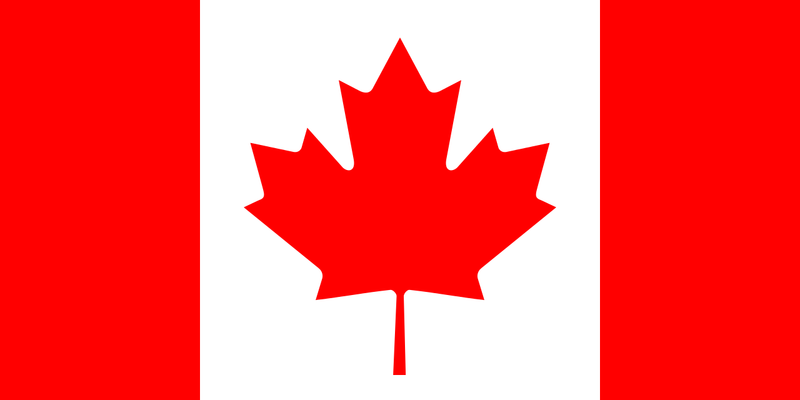 And while the cuts may sounds like a small number being across multiple newspapers in a publishing empire, these content creators made up a large portion of the news writers in many cities that had both a Sun Newspaper and another Postmedia property working under one editor in the same newsroom. That’s right: one editor, two papers, and both dailies. The Ottawa Sun, for instance, will now only have two full-time reporters compared to the 10 it had previously. Soon after the cuts were announced, former reporters took to Twitter to share their experience as part of the newsroom cull. Using Cision social software we monitored the reaction to the news across all channels of social media. Here’s how the data shook out. The conversation dominated Canadian Twitter. As of noon on Thursday, more than 5,765 people tweeted more than 8,900 messages that reached 38 million people around the world. Within minutes of the announcement messages from laid off journalists hit Twitter. 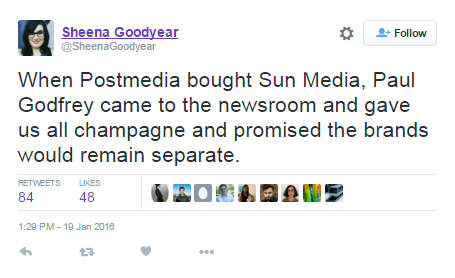 Other former Postmedia journalists such as Sheena Goodyear (@SheenaGoodyear) recounted her experiences of when Postmedia and Sun papers merged last year —showing the optimism many employees had about the deal. Once the stories about job losses started to pour through, broader media influencers joined the conversation. 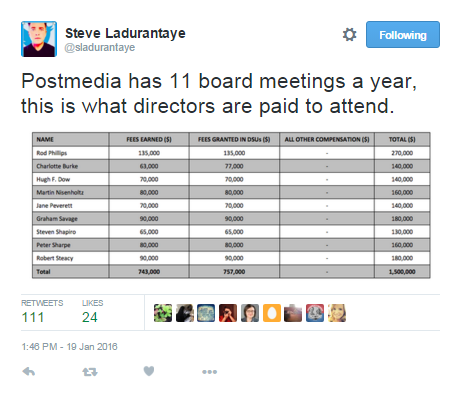 Steve Ladurantaye (@sladurantaye), Head of Canadian News and Government Partnerships at Twitter, shared earnings reports of Postmedia executives as well as the costs associated to board members to attend meetings. Ladurantaye juxtaposed high salaries and expenses of board members against the ongoing story of the cuts in a series of tweets. 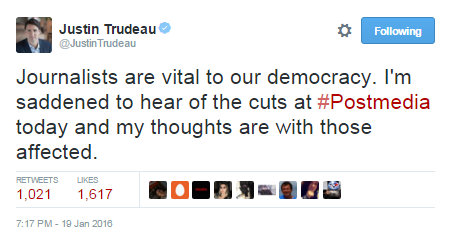 Even Prime Minister Justin Trudeau spoke on the issue, saying that journalists are required for a healthy democracy. Many social media communications crisis occur from a digital gang mentality with commenters attacking an individual or an issue. 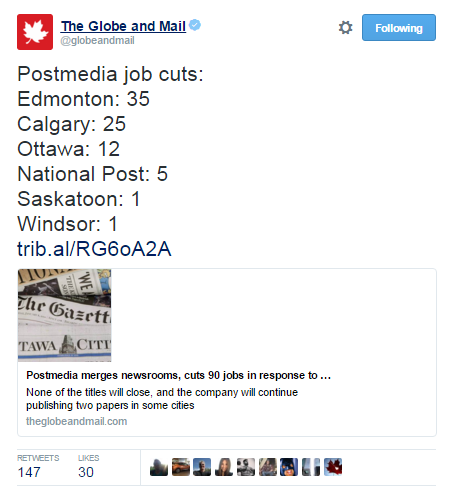 Case and point: 36 percent of the conversation about Postmedia’s cuts scored as negatively toned. On the same day as the announcement, Postash Corp. closed a mine in New Brunswick resulting in 400 Canadians being laid off. 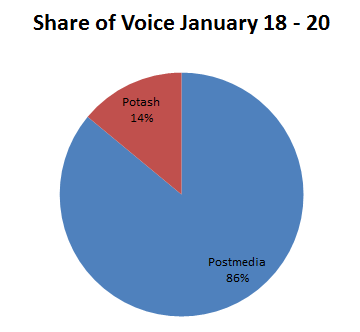 Despite the number differential of jobs lost, Postmeda’s cuts received 86 per cent share of voice over Potash Corp. between January 18 and January 20. As illustrated here, social media monitoring can help a brand identify issues and navigate them in real time. Whether a mob will form around an issue is often determined by the news of the day. 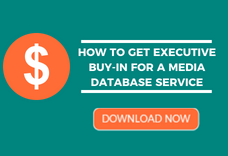 Learn how to monitor topics on social media by reading our Guide to Social Media Monitoring today.